After you’re done designing your page, Preview & Publish it. To preview click the icon. If you are satisfied with the result, go ahead and click the button. In Elementor you can edit a Published page and save your work as Draft. 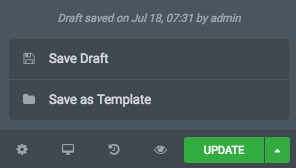 That means that you will not ruin your published page while saving your work as Draft.